The Rivers of Wales. A Natural Resource of International and Historical Significance. D. Dudley Williams & Catherine A. Duigan (Editors). 2009; XIV + 344pp. ; (incl. 8 colour plates), 19 x 26 cm, hardbound. Subsequent chapters bring together, for the first time, the combined expertise of a group of scientists whose intimate and collective knowledge of the Welsh aquatic landscape is unparalleled. The authors begin by describing the knowledge base of these important habitats, emphasising the structure and role of their plant, animal, and microbial communities. 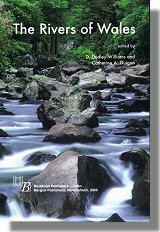 Upon this are built chapters that review the pioneering role of Welsh river studies in the development of running water science and, very poignantly, assess the high degree of human alteration of the principalitys riverine ecosystems. These are followed by chapters that discuss the need for further scientific study, management, conservation, restoration and education so that future impacts on Welsh waters may be understood and minimised. Throughout the book flows the underlying theme that there has been and always will be a close link between water resources and the development of Welsh society. The book is data-rich, very well illustrated, and contains a bibliography of over 1,100 references to the scientific literature. Example chapter - click here. DID YOU KNOW? There are over twenty major river systems in Wales supplied by an abundance of rain. Snowdonia is the wettest part of Wales with in excess of 3,000 mm of rain per year.